30-year carpet expert reveals little-known secrets about choosing new carpet wisely, avoiding common carpet scams and saving the most time and money possible. BEST & WORST PLACES to BUY CARPET! BEST & WORST PLACES TO BUY NEW CARPET! Don’t be the Victim of a Carpet Scam! See Who I Recommend NEAR YOU! Where are the best and worst places to buy new carpet and why? Read this free informative report to learn key carpet buying secrets from a trusted 30-year veteran of the carpet industry. Source: Buying Carpet From Lowe’s, Home Depot, Empire or Costco? Buying Carpet From Lowe’s, Home Depot, Empire or Costco? What Homeowners Need to Know… Before Signing the Check! The last time I checked, all four of these Giant National Carpet Retailers use OTHER companies to facilitate their carpet sales, measuring and/or installation services. That means if you ever have a carpet problem or complaint, you may have a hard time getting anyone to help you or take responsibility for making things right. Home Depot, Lowe’s and Costco contract out all their measuring and installation services to various privately-held companies? Empire Today REQUIRES all their salespeople to form their own CORPORATION so they will be Independent Sales Contractors? What does this all mean to YOU the homeowner? With so many fingers in the pie it is not too hard to figure out that you might end up paying way too much for your new carpet. These four nationally advertised conglomerates take a large chunk of the profit right off the top and then let all the other privately held companies and independent sales contractors each have a shot at making more money from your purchase. From costly measuring fees to needless carpet and padding upgrades, from carpet and padding removal and disposal fees to installation extra unnecessary and costly add-ons, there are plenty of ways they will try to make you cough up a lot more money before it’s all said and done. Get Three Rooms for the Price of One! Do these sales gimmicks sound familiar? Get out your magnifying glass so you can read all the fine print regarding these unbelievable offers. These advertised deals are designed to attract unsuspecting homeowners who would like to save money but don’t know how to go about doing it properly. Unfortunately, these four retail carpet-selling conglomerates are heavy hitters with deep pockets who have only one thing in mind: Making Big Money by tricking you into buying from them. Both Lowe’s and Home Depot have been trying to lure-in unsuspecting homeowners for years by giving away low-cost or free “basic” carpet installation. They make up a portion of this sneaky sales gimmick by charging more for the carpet and padding and by greatly increasing the cost for anything extra you might need to complete the job. They increase the fees and charges for anything and everything that is considered beyond their limited definition of a “basic” installation. Their so-called “free” carpet installation that lured you in, may not be totally free once their sub-contracted measuring people and installers get a good look at what you really need to complete the project in your home. It’s highly likely there will be numerous extra fees & charges tacked- on to your final bill. Final bill? Yes, and they also will require that you pay for the whole carpet job IN FULL before they will place your carpet and/or flooring order. The final bill comes on the day of installation when the installer determines that your job additional labor for moving furniture, or any extra labor or materials that can be considered beyond the limited definition of a “Basic” carpet installation. These extras can easily add up to hundreds for extra fees & charges that you were not warned about. As Gomer Pyle would say… Surprise! Surprise! Surprise! 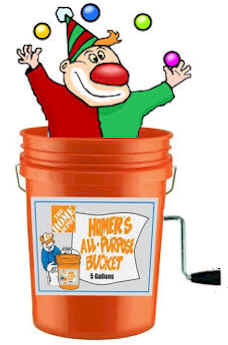 Home Depot’s Low-Price Guarantee? They say they will beat any competitor’s price by 10%, but according to the fine print, that’s only on identical in-stock items. That makes it virtually impossible to substantiate because they use private labels on all their carpet samples. They change the name of all their carpet styles and colors to make it difficult for you to comparison shop. A low-price guarantee sure sounds good until you read all their fine print. The Big Box home improvement warehouses have been charging homeowners a measuring fee just for coming to your home and sizing you up. From what I have been told by industry insiders, their licensed & certified measuring specialists they contract with are required to measure your home using a “special method”. Does that mean they add another 5, 10 or 15% of material to the total? Likely so! 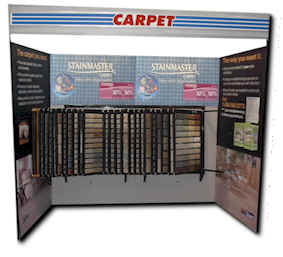 You may never know your accurate measurements for sure unless you get several bids or estimates from other local dealers, but basically the big box retailers want to make darn sure there is more than enough carpet or flooring materials to work with so they never have to worry about running short of material during installation. That might translate into you paying for a lot more for new carpet & pad then you might actually need. Just an extra 10 yards of material could easily add $250 or more to your total cost of your job. Ouch! Empire Today likes to attract customers by airing repetitive TV ads featuring unbelievable sales offers with next day installation. If you call them, they will send a sales professional to your home who will show you samples and try to “close the sale” on the spot. Are you getting a fair & square deal? How long will these flooring products last in your home based on your level of foot traffic? Are they trying to sell you a low-quality Polyester carpet and say it’s as durable as a Nylon Carpet? These are just a few questions that you need solid answers to before you should commit yourself to buying from any shop-at-home flooring retailer. All these retailers all use private labels on their products and use independent contractors to measure, sell or install their products. If you have a complaint, you may have to deal directly with the independent contractors to get a remedy. Have a Carpet defect? You’ll have to contact the carpet manufacturer. Have an installation problem? You’ll have to contact the carpet installer. Did the salesperson misrepresent the product you purchased? You will have to contact the independently contracted salesperson. If you can’t get a remedy you may have to file a claim in small claims court. Costco members are shown a small display with a rack full of miniature carpet samples. (Lately they have been taking the samples down) See the photo at the top of this page? If you grab their free brochure you will be provided with a phone number to call to start your in-home Carpet Consultation Process. A salesperson will bring samples to your home and be happy to write up your order and arrange for installation. While they do carry some good quality carpet, be prepared for sticker shock when you see what the total cost will be. Again, you can’t comparison shop easily because they change the carpet style names and colors to thwart you. You would need to take their carpet samples with you into other carpet stores to try to compare both samples side by side. It’s definitely not easy to do. It’s taken me years to locate, investigate and identify these locally owned and family-run businesses and I think they are the best of the best here in America! I suggest you visit several flooring retailers near you, get several estimates and be sure visit a carpet store that I recommend if you can. You decide for yourself who to buy from. When it’s all said and done, I think you will agree that my preferred dealers are the most knowledgeable, Reliable and reputable! There’s a lot more you need to learn before you head out to shop for new carpet. Should I buy New Carpet from Lowe’s or Home Depot? Learn what questions you need to ask and what you need to do before,during and after you have new carpet installed in your home! Learn little-known insider tricks and tips to make sure you get the job done right the first time and what you must do to keep your new carpet warranty in force. Discover smart ways to ensure you side-step common consumer mishaps and avoid costly carpet buying and installation problems and mistakes. Most homeowners quickly discover that selecting new carpet is difficult, time consuming and confusing. CarpetProfessor.com was created to help educate homeowners sort through all the nonsense. If you don’t do your carpet homework, there are dozens of ways for you to make costly mistakes and end up unhappy with your carpet purchase. Making wise choices requires that you do your carpet homework before you begin shopping for carpet.